COMMUNITY TO GAIN NEW LAND POWERS. More than 40 island residents gathered in the Village Hall on Tuesday, 23rd March, to hear all about new powers granted to them by the Scottish Government. Land ownership is currently a burning issue on the island, as CCDC is trying to build much-needed social housing units for the 10 or so young people who are either entirely homeless or are inadequately housed. Attempts to purchase land owned by Colonsay Estate in Scalasaig have so far failed. The new laws in question are the Community Empowerment Act and the Land Reform (Scotland) Bill. Ailsa Raeburn, Head of Community Assets at Highlands and Islands Enterprise, explained that, for a successful sale, there had had to be a willing seller unless it was crofting land which was in question; in that case, the owner would be obliged to sell to the community. As of April 2017, if the community can prove that a particular piece of land has been neglected or abandoned, and that the current landowner is not using it for the purposes of sustainable development (e.g. social housing, business units) they have a case. If they have a particular social purpose for the land, can convince the authorities of the viability of the project and demonstrate the backing of their community, the landowner will be obliged to sell the land at the valuation stipulated by the District Valuer. David Cameron travelled from his base on the Isle of Harris to tell us about the 8-step process of purchasing land and about the support that Community Land Scotland could offer rural communities like ours. He described the North Harris project, in which he has been involved; before community purchase, there were 130 people living in the community; there were zero business premises, zero privately rented houses and zero community facilities. To date, the population has risen to 170 and three business units, a pontoon and a wind turbine have been built. Other innovations being considered included hydro-electricity schemes, polytunnels, hook-ups for motor-homes and caravans, and a caravan site. 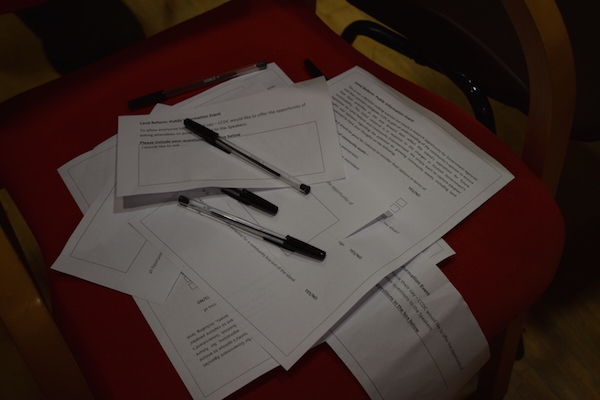 The Public Meeting was an excellent chance for local residents to learn about their land rights as a community; it also offered CCDC the chance to ask those attending (around half of the active adult population) what their preferences were. At the time of writing, these results had not been publicised. However, early indications are that not a single respondent was happy with the current situation. Almost all were in favour of attempting small-scale purchases, such as land for housing, or existing amenities e.g. the hotel or possibly the shop. What was remarkable was the clear majority in favour of a community buyout of the entire island (excluding private/Council/HIE etc property) from Colonsay Estate. So we are living in exciting times: the thrust of the presentations by CLS and HIE was that the time is ripe for community buyouts: the legislation is there, political support has been offered and the Scottish Land Fund has grown from £1m to £10m. So…. will the community take advantage of the opportunities offered, or will the status quo be maintained? Keep reading the Corncrake to find out! 43 residents attended the meeting and were invited, if they so wished, to inform CCDC of their attitudes and preferences by completing a brief questionnaire. 25 completed forms were received. The breakdown of the responses is as follows. I am happy with the way things are and don’t want or see the need for change. Other e.g community-owned farms, business units.